I am deeply gratified to tell you that our long-awaited new building on Berkeley Way is on its way to being fully funded with an anticipated groundbreaking in 2020 and completion in late 2021 or early 2022. This is a project that seemed impossible from the start. Yet, thanks to so many people, the impossible is happening. Architectural rendering of the Berkeley Way project facing east. The Loma Prieta earthquake of 1989 had affected many older buildings in a similar way, but in this case, all I could think about were the lives of the men in our shelter, whose safety and health were the responsibility of our agency. From that day forward, I have been on a mission to build a replacement for the men’s shelter, and hopefully more. This is how the Berkeley Way project started to take shape. View of the Berkeley Way project from Henry Street. I began to speak with hundreds of influential people in Berkeley, asking for advice on how we might be able to build a replacement shelter. I am particularly grateful to Amy Davidson from the Health, Housing & Community Services Department; Dorothy Walker, a noted community activist; Sam Davis, an architect with experience designing affordable housing; and Kriss Worthington and Linda Maio, both now retired from City Council. With their help, we began to refine our vision for a new building and concluded it needed to contain not only a replacement for the men’s shelter, but also permanent housing for the homeless, offices for support services, and a permanent home for our meal program. It was at about the same time that the Downtown Area Plan was being developed. We noted that a city-owned surface parking lot on Berkeley Way was being rezoned for future affordable housing and homeless services. Nevertheless, there were barriers to building that seemed insurmountable – notably the amount of money it would take and our complete lack of experience in a project of this magnitude. With Kriss’s leadership, City Council passed a resolution in 2009, unanimously supporting the idea of a new building, which read in part “Bringing together a permanent housing component with the men’s shelter is a fundamental tool for ending homelessness. This visionary project is an exciting opportunity to maximize services to the homeless while increasing efficiencies and economies of scale.” With that endorsement in hand, I was able to move forward. 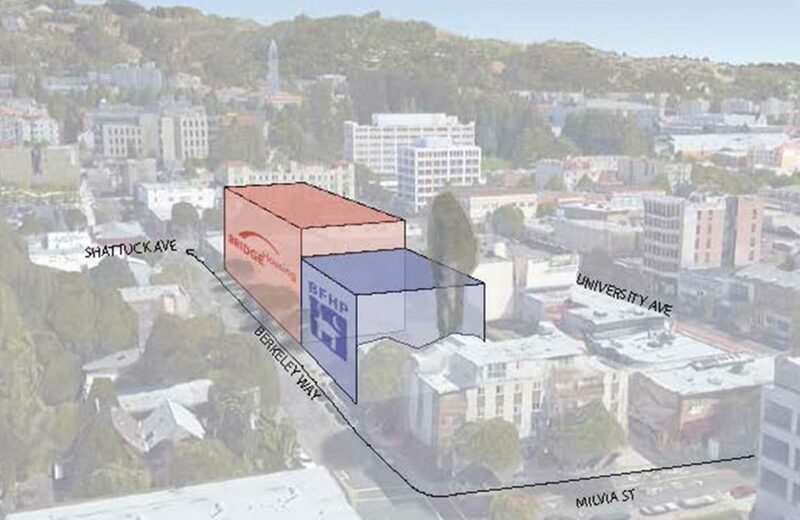 With some assurance that the City would eventually issue a request for proposal (RFP) for development of the site on Berkeley Way, we wanted to be prepared. When we began to look for an experienced development partner, we were introduced to BRIDGE Housing. 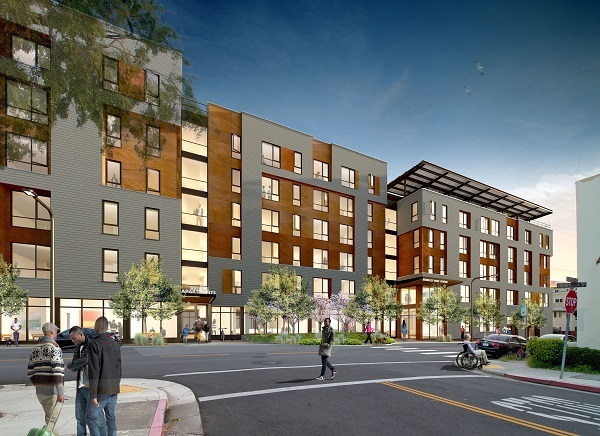 With their reputation for building mission-driven affordable housing and their skill in developing urban in-fill, they proved to be the ideal partner. BRIDGE Housing, will build on the same lot and provide 89 affordable rental units. Taken together with the BFHP building, it is the largest infusion of affordable housing in the history of our city. Together with BRIDGE, we identified Leddy Maytum Stacy as the ideal architectural firm to work with us. In 2014, when the City issued a Request for Qualifications (RFQ) for teams to respond with their plans for the site on Berkeley Way, we were ready. This was a public and highly competitive process. In due time, our team was awarded the right to develop the site as a mixed used project combining affordable housing and homeless services. 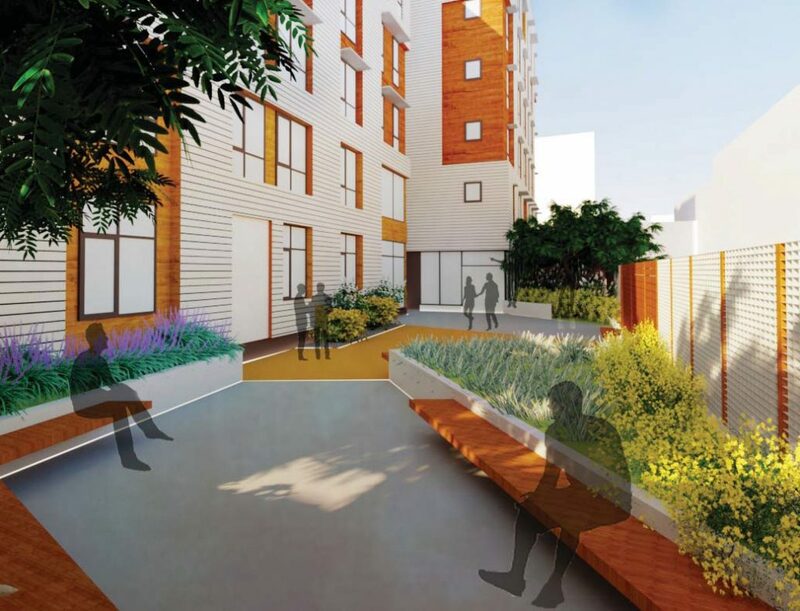 Rendering of the ADA compliant courtyard in the Berkeley Way building landscaped with native plants. When Jesse Arreguin became mayor in 2016, we gained a powerful friend and ally in the fight against homelessness. I have often thought that it is the job of good politicians to dream, solve problems, and envision a better future. That is what Jesse Arreguin and his staff set out to do and their advocacy and support for our building has been unprecedented. There is much more to the story and it isn’t over yet. However, this is a time for me to say thank you – to everyone who has helped and supported this project for the past fourteen years – and they are too numerous to list here. I am humbled and deeply grateful for a community like Berkeley that truly cares for the welfare of our unsheltered neighbors.